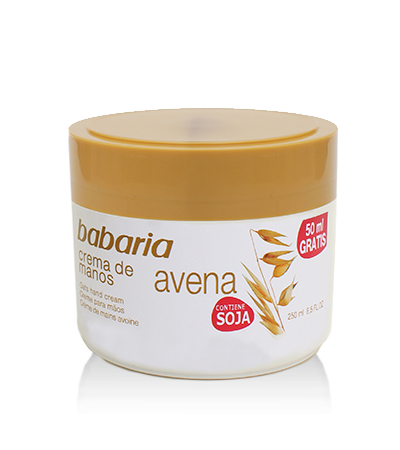 ACTIVE INGREDIENTS: Oat extract, soya and glycerine. PROPERTIES: Oats have skin-softening properties which help to prevent the formation of cracks. Glycerine helps to retain moisture and prevent dehydration. Aloe Vera has reparative properties, helping to improve the skin’s moisture levels. Especially formulated for hands that are dry and cracked from everyday tasks.Glycerine retains the skin’s moisture levels, keeping it soft and smooth. Rosehip Oil is rich in essential fatty acids, Omegas 3, 6 and 9, which are important components of all cell membranes, giving them greater permeability and elasticity. They also have excellent water retention properties,increasing the skin’s hydration levels thanks to their occlusive capacity and the structural changes they cause in the corneal layer. The cream contains a special ingredient to prevent it being dissolved by water so it remains for longer on the surface of the skin. ​Olive oil is an excellent and highly nourishing emollient which is widely regarded as LIQUID GOLD. The moisturising agents retain the skin’s hydration levels, keeping it soft and smooth. Contains a special ingredient to prevent the cream from being washed off so it stays on the skin for longer.